Can I treat my pet's wound at home? When managing wounds at home it is important to always contact your veterinarian for assistance. Many home and even human wound remedies are not suitable for use in pets. Determining factors in deciding whether a wound can be treated at home or needs veterinary care includes the severity and age of the wound, the cause and location of the wound, and most importantly if the pet is leaving the wound alone. In most instances the safest and most effective way to deal with it is to take the injured pet to the veterinarian for initial treatment and advice on continued care at home. In this article we will go over some of the major components of wound treatment and care as well as giving you guidelines on when to visit the vet. Severity of the wound: Minor scratches, bruises and nicks can be taken care of at home. Any cuts, puncture wounds, severe bruising, multiple wounds and especially any wound caused by dog or cat fights should be seen by your vet. Any wound obtained by fighting will inherently be an infected wound and should this wound not be treated correctly the formation of an abscess is almost a certainty. The age of the wound: This is an important factor as it contributes to the next course of action. The concept of the golden period is something that helps determine whether a wound may be stitched and allowed to heal by first intention (faster healing, less wound management and less scar formation) or if it should be allowed to heal by second intention or as an open wound (slow process where the body has to rebuild tissues and heal itself, intense wound care and large scar formation). The golden period, the time within which one can successfully clean and stitch a wound without much consequence, is generally within 6 hours of the wound’s occurrence. Thereafter it becomes tricky and one has to seriously consider the consequences of closing an infected wound. Also if a wound is a few days old granulation tissue has begun to form and second intention healing started, in this instance it is very unlikely that the wound could or should be stitched. The cause of the wound: As mentioned previously any fight wound should be seen by a veterinarian. In the event an injury is caused by something else, the relative cleanliness of that object comes into consideration along with the other factors. The less contaminated the cause of the injury the less risk for contamination and infection. Location: Certain areas of the body heal better than others. The extremities (i.e. lower legs, feet, tips of the tail and ears) tend to heal more slowly whereas those over the body and neck and upper legs, tend to heal better because of the copious blood supply. Wounds in areas of the body that undergo constant motion do not heal as well as those located in a more stable area of the body. The motion does not allow time for tissues to work themselves together again and these locations are also more prone to fluid accumulation in and around the wound. Wounds on the body and neck can often have large pockets of space where fluid readily collects as a result of the large amount of skin that is more easily torn away from the underlying tissue, especially during fights. Self trauma to an existing wound (Is your pet leaving their wound alone? ): It is a natural response for animals to lick their wounds, this can help to initially clean the wound but as their mouths contain very high numbers of bacteria it can also aid in the contamination and infection of the wound. Also constant licking and bothering of a wound can impede the healing process and even do more damage. If your pet will not give their wounds time to heal it will result in a chronic non-healing wound. If you have determined that it is not necessary to bring your animal to the vet, home wound treatment will ensue. First it is important to clean a wound and human antiseptic solutions work well for initial wound treatment. If you are in doubt about what solutions you can use, rather use plain water and flush the wound with plentiful water until you can contact your vet or take your animal in to be seen by the vet. Once the wound is clean you may apply human wound treatment ointments such as Germolene and Bactroban. Be warned any ointment applied to a wound will often be licked by your pet so it is important to prevent this. An Elizabethan collar (cone of shame) often works well as it keeps the pet’s mouth away from the body. It is never a good idea to attempt bandaging a wound at home. If bandaging is not done properly it can have very serious consequences, doing more harm than good. If it is done on a short term basis i.e. just to prevent bleeding while transporting the pet to the vet, it should be fine. Once your initial treatment is done always contact your vet and ask for advice on what to do next. Most wounds will need cleaning at least twice a day. Ask your vet for a cleaning solution safe to use in the long term as most human antiseptic solutions are good enough for initial wound cleaning but are strong and may inhibit healing of the wound in the long term. As for wound cream, you can use human remedies but there are also veterinary products specifically designed for use in animals that work well and assist in the healing process. 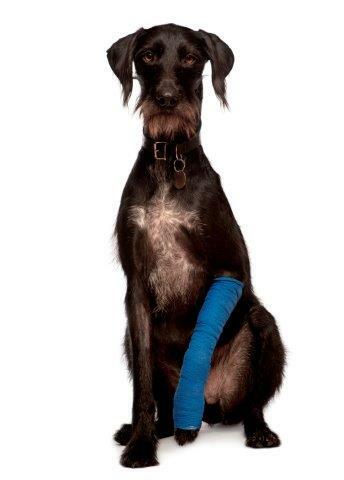 In the event that it is not appropriate to care for the wound at home, take your pet to the vet for examination. Based on the assessment of the wound one or more of the following course of action can be taken: Shaving around the wound, cleaning the wound, disinfection of the wound, debriding the wound (removal of dead necrotic tissue and debri) or stitching the wound with or without the placement of a drain. Shaving and cleaning the wound will expose the wound and help to remove all dirty and infected material in and around the wound to aid healing and allow for easy access for home treatment. If a wound is not to be stitched your veterinarian will give strict instructions on how to care for the wound at home, dispense medication (topical treatment, antibiotics and anti-inflammatories as the situation requires) and have you in for regular check-ups to monitor the progress of the wound and determine the course of action as the wound matures. If a wound needs to be stitched your pet will be admitted into the hospital and placed under either sedation with local anaesthetic or full general anaesthetic, depending on the severity of the wound to be stitched. In the event that large pockets and open spaces are found under the skin a drain may be placed near the wound to allow drainage of fluid the body produces in response to the trauma. These drains are generally left in place for 3 days giving the body enough time to close off the open spaces and start the healing process. These will then be removed. If a wound is stitched without the placement of a drain, there will be little to no wound care at home except to monitor the healing of the wound and bring your pet in for stitches to be removed. If a drain is placed you will have to clean around the area twice a day until the drain is removed. In conclusion most wounds will require at least initial examination by a veterinarian and in all instances seek the advice of your vet. Prevent your pet from licking or further traumatising their wounds and ensure regular cleaning and care. Do not use any wound treatment on your pet which you would not use on yourself.